While certainly not without its flaws, Invasors is well worth a look. A super slick animation makes a good first impression for this 2GB multisampled analogue synth emulation for Kontakt and Kontakt Player. 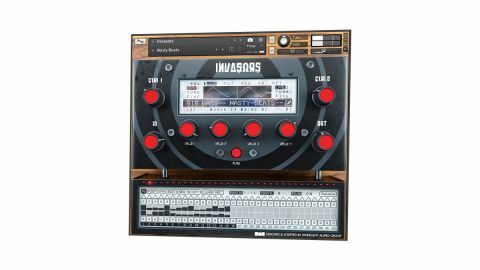 Invasors puts hands-on programmability to the fore, with an old-school interface that can be negotiated entirely through the use of eight MIDI-mappable knobs and a faux LCD display. Its two oscillators each load one of 128 waveforms, while low- (regular and “Daft”) and high-pass filters are modulated via LFOs or an envelope. The step sequencer at the bottom enables a handful of parameters (velocity, pitch, FX and LFO) to be programmed over up to 12 sequences of up to 32 steps each. Invasors sounds great, with the 128 waveforms providing plenty of fuel for the filters and effects, and the sequencer bringing it all to life nicely. However, while the ‘painting the hall through the letterbox’-style interface starts out quite fun (particularly if you’re using a Kontrol S keyboard), you quickly find yourself wishing there was a lot less screen switching involved and that you could just get to more parameters from the front. The absence of a manual isn’t helpful, either.